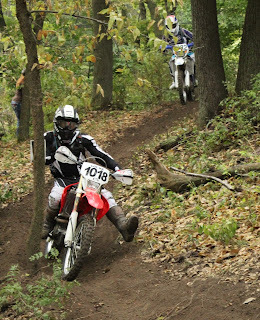 Trails Revenge Hare Scrambles. 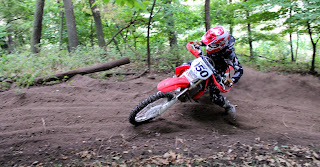 I do not know where the name came from, but those trails in Thurman Iowa did enact a bit of revenge on us this weekend. What we did wrong is still in question. Some sweet dirt up in Iowa. The course was advertised as having no rocks and some good dirt. Sure enough they delivered but what they did not tell you about is all the ravines, drop-offs and ridges that you had to watch out for. On our practice lap Christopher fell in one of them when we were taking an alternate route to get around a long line of riders waiting to cross a small muddy creek section. We tried to pull his bike out, but with weight of the bike and the front wheel being stuck a foot in the mud it was going nowhere. With only one choice/chance I decided to try and ride out of the ravine. 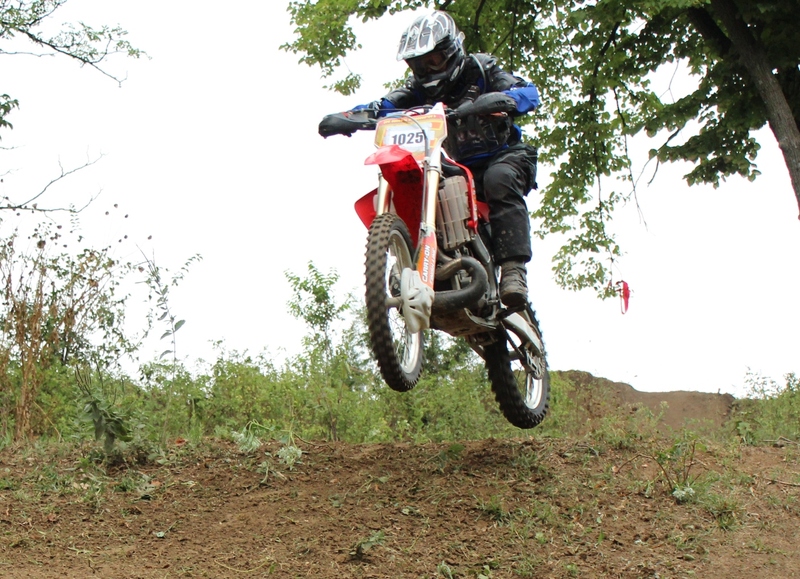 Once I got the bike upright I got her going along the edge of the dirt wall where it was a little drier and offered some traction. The ravine was about 5 to 7 feet deep with near vertical walls. I noticed a small bit of erosion and some roots down the wall and on the side where we needed to get up to continue on the course. I clicked his 250X up into 2nd gear pinned it as I tried to gain enough speed to cross the foot deep mud and make it up the other side. I still do not know how I made it, but I did. Big air can also be found up in Thurman, IA. This section reminded me of Unadilla MX before it got all modernized. Cool natural jumps that allowed some nice air time. Nick Plesa taking the high line on Sunday. A good field of riders in each class. Most were series regulars who made the trip North, but there were also a few local riders who really knew the quick way around this course. Doug finished rebuilding my bike on Saturday. New piston, rings, valves. It was running like a champ on Sunday. 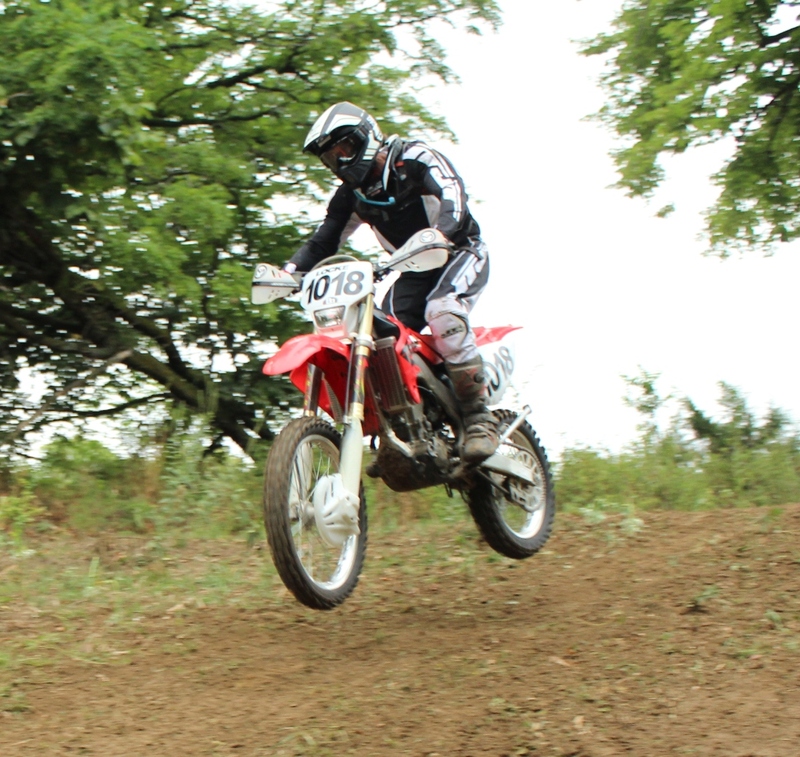 I had very quick reactions and was able to have excellent clutch and throttle control which got me out to a great start. Out front leading the Senior 45+ class. I seem to do very well when the starts are more open like a traditional MX race. After the start this little drop-off the technical trails started right away. Some moisture in the ground made it a little greasy in sections that had no sun early on, but by the end of the race it was really nice. Local rider and eventual race winner Dennis Murphy begins his charge to the front early on. Christopher was about 3rd off the start. This would soon change once on the course. Lots of cool woods sections. The one element that gave Christopher trouble was the up hills and muddy . Some were very short like the these above and below. Others were very steep and long. Being in the correct gear at the base was very important along with plenty of momentum. On the easy single track sections Christopher looked good and was able to bridge up to riders in front of him. One of the many short climbs out on course. If you hit the correct lines and kept the power to the ground things were easy as I demonstrate. This is what happens if you did not hit your lines correctly and/or another rider had already crashed in front of you. Notice the girl laughing at Christopher crash. He does seem to crash in a silly kind of way as most beginners do. Out front on the first lap. The off-camber sections were a little tricky but if you used good form and control you could really fly. I was going good until I bridged up to some 600's/700's. They had crashed down in one of the many short gullies and I tried a line to get around them. 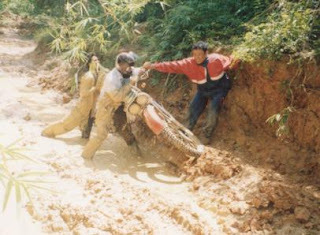 It did not work out so well for me and I ended up getting stuck just at the top when my rear wheel got stuck in the large root. By the time I got out my lead was gone and my eye glasses were all fogged up. 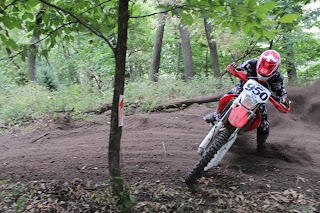 Local Iowa rider Dennis Murphy was on the gas and went flying past me on one of the fast downhill sections after the jump. After my little incident I did my best but rode very tense. Mostly because I could not get my glasses from fogging up. There was just enough humidity in the air to cause me problems with vision. It is very hard to ride fast when you can't see the trail, especially one you've not ridden before. I ended up falling back to 4th place during the middle of the race. When Christopher was alone he rode well and fast. Other riders and their mishaps caused most of his problems today. However, there will always be other riders out on course so we all have to learn to work around them. The last lap I finally settled into the course and got my vision clear. I started to attack the course and was able to bridge up to 3rd place. Soon after I passed another local rider Jerry Warner from LaVista, NE. for 3rd place. My final lap (6th lap) was my fastest in 19:26. You really had to attack the hills and Christopher did this well, but sometimes he does not know when to back off . Luckily you usually end up going where you are looking and Christopher narrowly missed this tree. Christopher end up getting 8th on the day. Not a good points day at all, but as I would later find out he is only riding for the fun of it and having a bad results day out riding his bike is still fun. 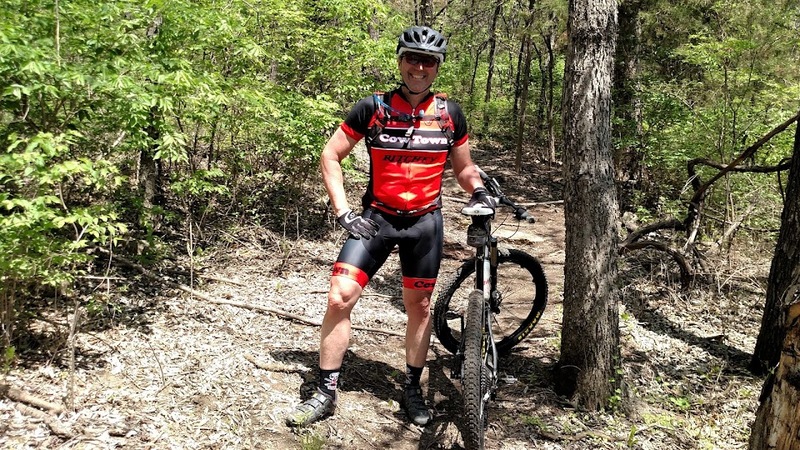 Last night was our first official night pre-ride for this years Wyco's Revenge MTB Race. Below is a shorter video. Still working on the full lap video. The file was very large and failed on the first attempt to upload. For those who do not like to ride at night do not forget we have the Sprint division at Wyco's Revenge and no lights are required. 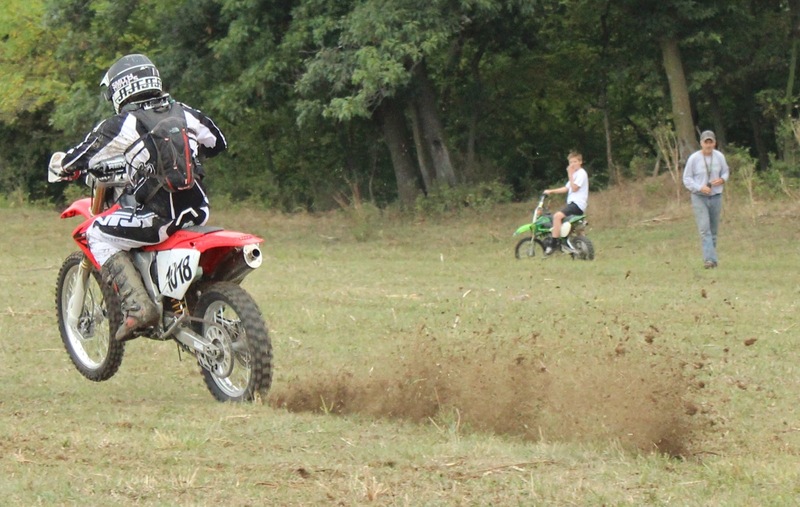 It is Thursday and nothing is ready for this weekends Forward Motion Hare Scrambles in Merwin, Missouri. Christopher did wash the bikes, but we still needed to change the oil (trans and engine) and put a new air filter in. I have found out the hard way that keeping a clean filter in is the most important thing on these 4 strokes besides changing the oil. I go to change the oil on Thursday evening and tried to start my bike. Nothing. I knew right away what it was - valves are gone. With a little technique that I found about on-line I finally got her started. Would she start come Sunday? Our routine on race morning is just about set now. Unload the bikes, set up the canopy first thing before the sun starts baking you, check emails and FB (for Carolynn) and finally get dressed for a recon/practice lap. With the heat today staying cool was very hard and any bit of shade really helps. I notice a few people had large shop fans. That is one item I intend to add to our equipment along with some cooling vests. One other item to add to the morning routine at Merwin is to practice your live engine starts. We got to use the backward falling gate. Notice I said "backward falling" gate. Christopher was on his own today. I did not get a chance to pre-ride the course because my bike was on its last leg. We had a two race format today to help reduce the number of riders on the course. First up was the 600's (C riders). I like the two race format but when it is time for me to move up in class (looks like I will have to do that next year) that means I will be racing after Christopher (assuming he only moves up to the Sport level class). That is going to make for a very long day. I was able to get my bike started despite the valves going bad. It started but did not run very well. I got her going about 15 minutes before the start and kept her running. I lined up early and baked myself in the heat just waiting for the 11:00 am start. You can see me in the background without my umbrella girl. Where the heck was my umbrella girl? Can you answer that Carolynn? It was Lauren Shafer's (#82) birthday. Well actually it was Saturday. It is good to see some women out participating. I still do not know what they do not have a women's class anymore. Classes are all based on ability or age. A full gate again for Christopher's race. A good start would be critical today. The course is very tight and it is hard to pass on for the most part. 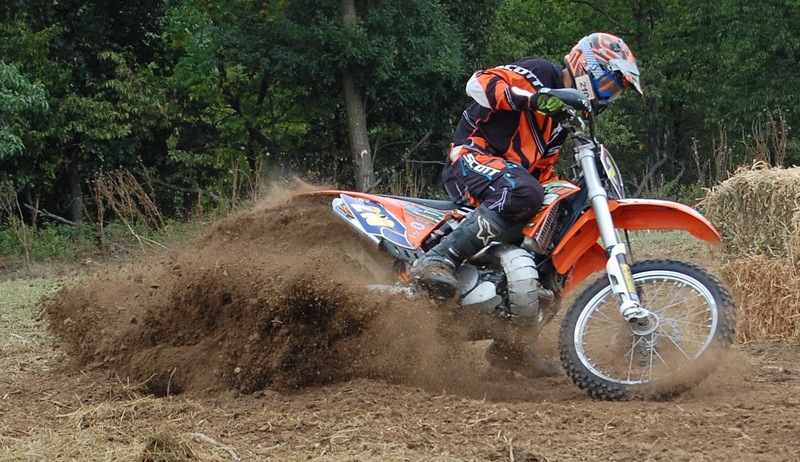 There are a few open sections like the MX track and some fields, but with the dust it really makes it hard. Starts are always cool to watch. They look more dangerous than they are. Everyone looks like they are all out of control going full throttle into the first corner. Remember I said it was a "backward falling" gate? I do not think Christopher realized this and ran into his gate. He said it did not fall, but I find it hard to believe that out of 40 gates his was the one that got stuck. After working his way around the gate Christopher was off in DFL ready to enjoy a day of riding in the dust. My start was not so good. I got off the line great, but my engine bogged really bad. Power was down big time and I had some trouble keeping the engine running. After some mistakes by the early race leaders Brian Moore, Dennis Tschirhart and Joe Lederhouse I found myself in front with a nice lead. 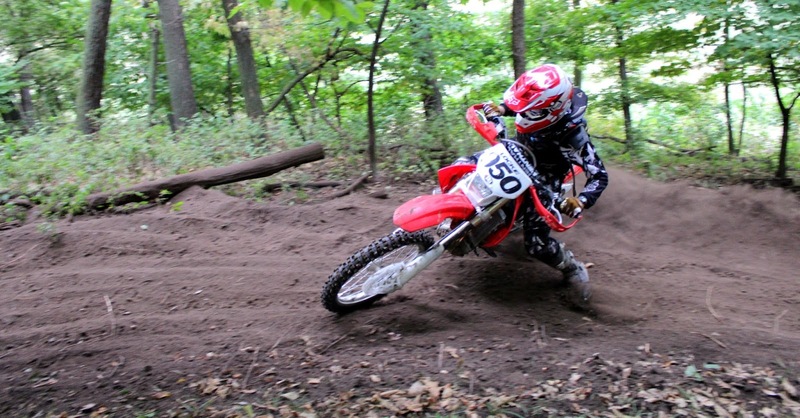 Dennis Tschirhart had a good day finishing up 2nd overall in the Senior class. He slid out after we both were working our way through the 700 club. Good job out there Dennis! 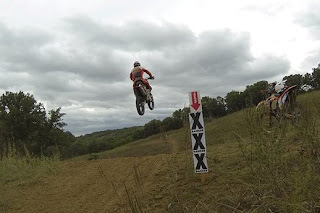 It is nice to have some of the course on a MX track. 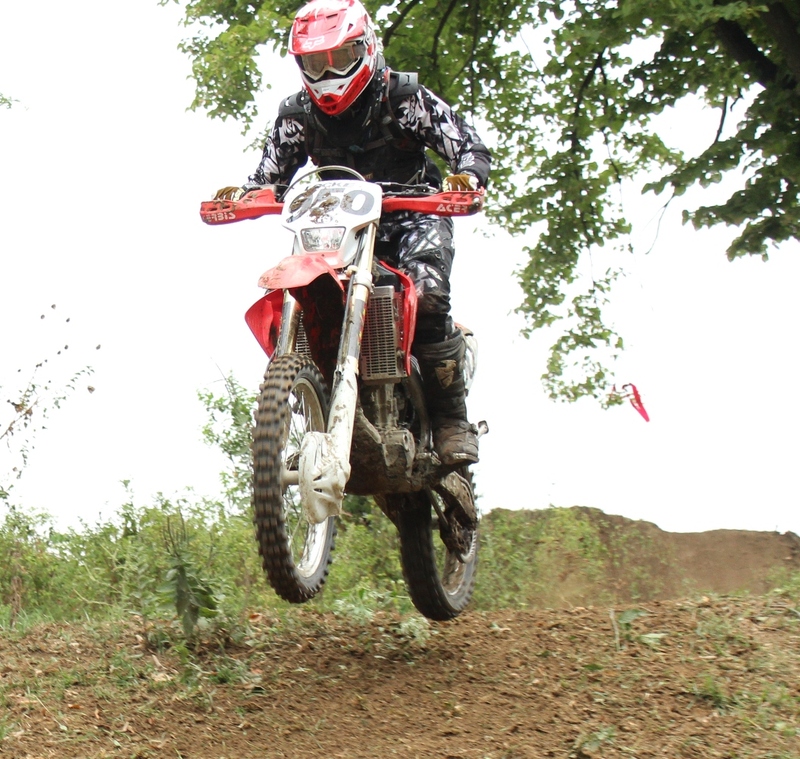 Opens things up some, allows for passing and also you get to have fun flying over the jumps. The always cheerful Randy Wade earned another podium spot today with a 3rd place. I like racing against guys like the Senior class. We are all out to have fun and enjoy riding. I told Randy that I might not be able finish today with the way my bike was running. He told me to call him next time if I am having bike troubles because he would let me use his spare bike. I just might take him up on that offer next weekend if Doug can not get my top end rebuilt by then. 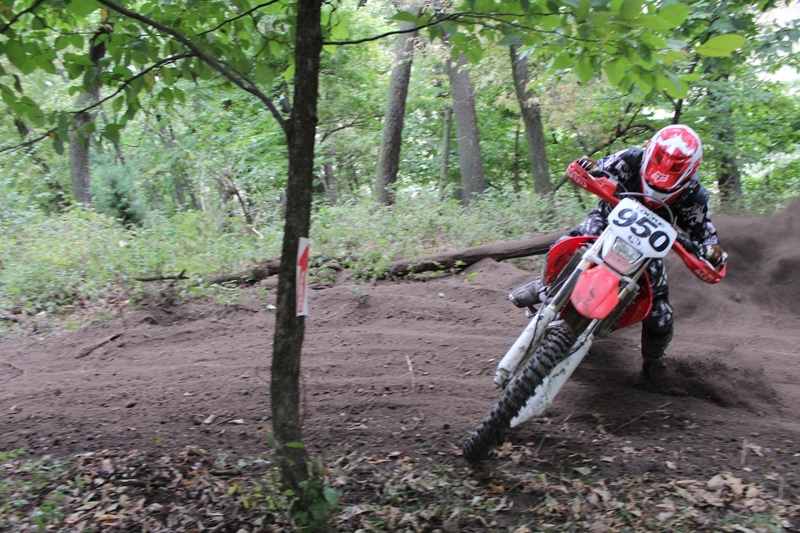 Joe Lederhouse got by me in the first mile of the course with a nice line through this tight woods section. I was impressed by the move and settled into following him for awhile as his pace was good. 4 turns later he ends up crashing when his front tire washed out in a slick dusty turn. I just did miss him but the crash injured his leg. On the third lap he crashed again and this time broke his throttle cable. What does he do? He disconnects his cable and uses a small pair of vise grips to use as a throttle. Ever try riding with a vice grip as a throttle? I do remember using vice grips for a steering wheel for a Go Cart when we were kids. I have this picture of my brother Joey riding this Go Cart with a vice grip. He is totally sideways sliding with the gas full on around this horse rink (It must have been a multi-use rink because we we used it as a flat track course :-)) . I will see if I can find it and post it up. Classic photo. Christopher was on the charge the first lap passing his way up to 9th place. Then he got stuck behind this one rider that he just could not get around. He also crashed once over the next two laps. This put him down in 11th place by the end of the 3rd lap. Not the place you want to be if you want to win the series championship and your main competitors are out front. One good thing is Christopher's form is improving. Check out those elbows :-). Now if you can just get him to stand up more. Heat (over 100 degrees) was bad today and so was the dust in sections of the course. You really had to search for traction out on the course. The bike would skate around in sections just sliding on top of the ground. Some fire got back into Christopher on the 4th lap and he started to pick up the pace and move up. With his current 11th place position he would lose the points lead in the series. He had to work his way up to close to a top 5 position to keep it. At the 1 hour 45 minute mark things did not look good. By the last lap I had about a 6 minute lead. The heat was really affecting everyone including myself. I am lucky the heat effected everyone else more because if would I have had to push the pace I would have not been able to on this day. I was lucky to just keep from vomiting in my helmet. By the end of the race I was very sick. It was hard to keep focused and ride. I started to bounce off a couple of trees and had some close calls out there. Sunday evening was spent in bed and in front of the toilet. I have not gotten that sick after a heat race since racing in the Midwest Fat Tire Championship Series and trying to chase down that damn Mark Studnicki. One of the reasons I cut back on racing mountain bikes is the heat. 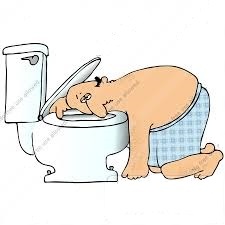 My body just does not tolerate it - my body stops digesting food/water and my stomach swells up and I get nauseous. Severe headaches soon appear and I end up getting really sick and spending the next couple of days recovering. All the while vowing to never do anything in the heat again. 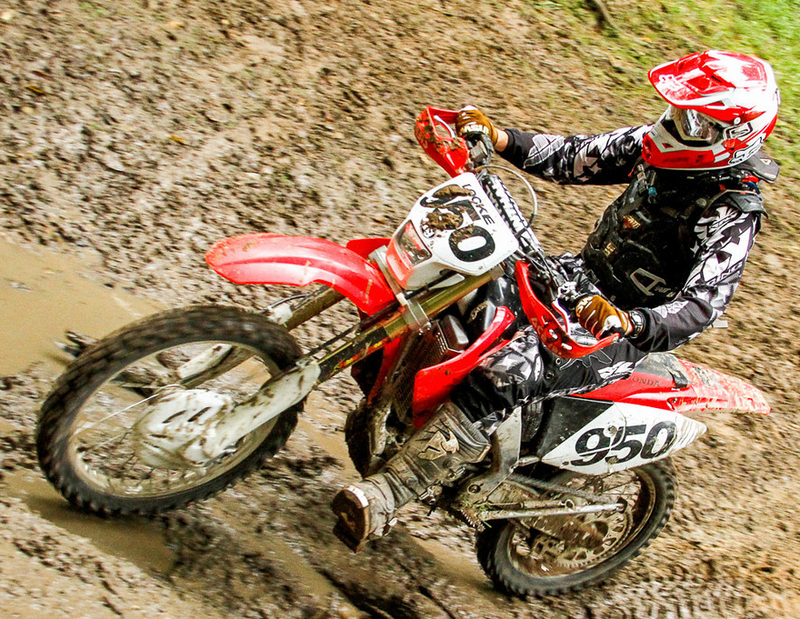 Randy Wade action again on the Merwin Motocross course. Christopher was not far behind Randy on the course and Carolynn was able to catch him while he attempted to worked his way up through the field. I am liking Christopher's form and his angle of attack on this pass. I can imagine what he is telling himself "what did Dad say again about corning? 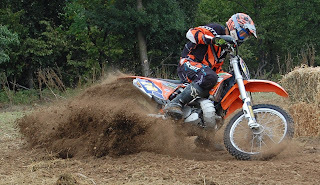 Oh yea, stand up entering the corner, as you lower yourself down on the seat, re grip the throttle and slowly roll on the gas all the while looking at your exit point and weighting the outside foot peg. Let's try it and see if it works"
Success! Sweet pass on two riders at once. Christopher's fastest lap of the day was his 5th and final lap. If he could have run that pace the entire race he would have been right up there with the leaders. 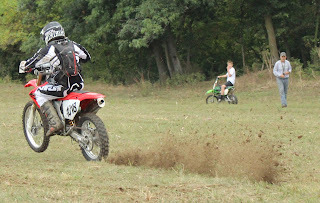 On the gas again in some whoops. Looking good working his way up to 6th place at the end of the day. This earned him enough points to keep the points lead by 2 points. The final rounds will decide who takes home the title. The Schupp's came out to visit us today. Jason recently got a bike to ride and looks forward to joining us. It seems that the majority of my friends either ride motorcycles now or had raced in the past. Many of them are going full circle like I did and returned to the sport. I intend to continue to ride but also race triathlons and cycling as well. I have one or two more Hare Scrambles then it should be time to hit some fall MTB races and then cyclocross that last part of the year.